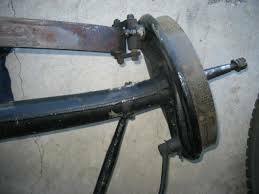 Do You Have a Bent Rear Axle or a Spindle End is Damaged? A common problem for Chevy Silverado 3500, Ford F-350 Super Duty and Dodge D3500 dual wheel rear ends is damage you can see, not internal. A bent rear housing sounds like it is time to buy a new rear end but that is not the case! HRA has the skills and the tools to repair your axle back to factory specs. Supply us with your bent rear axle assembly and we do all the work. How do you repair a spindle end or bent axle? The first step is to tear down the axle to a bare housing and put it on our lathe. We will check the tubes to make sure they are straight. If they are bent, we can straighten them. While on the lathe, if the spindle end is damaged, this is when it gets replaced. We manufacture the replacement spindle in-house. These can not be purchased anywhere. Once the spindle end is built, we cut off the damaged spindle and weld on the new replacement. What else do you check or replace on the axle? Once teh axle has the new spindle, we will verify it is perfectly straight. If the spindle is not on and within specs your truck will burn up tires, break an axle or damage the hub seal. We then install a new hub, bearing set, rotor and seals. The opposite side will have the bearing checked, seal replaced and we also turn the rotor. The center will get or fluff and buff treatment to make sure it is road ready. The final step is filling it with fluid and painting the housing. Your axle is now turn key and thus, ready to install. When reinstalling the axle assembly, make sure the vent tube and vent hose are very clean. Debris inside either of those will cause pressure to build up. This will cause the pinion seal or axle seal to start leaking. Call or email us for a quick price quote today!